On the Ethics of Conspicuous Consumption: my law firm had a lunch seminar on advice for associates once, and the gaming-law partner spent a few minutes on the importance of dressing the part. "It's better to have one $1000 suit than two $500 ones," he said. Paul Kahn certainly never mentioned that to our small group! "Every time I read this case, I think I understand it a little less." 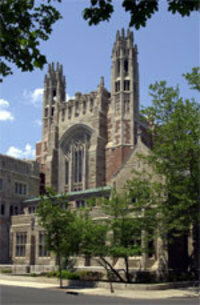 Another great Paul Kahn small-group comment: "The ideal number of students at Yale Law School is zero." Student: If you don't like reading the exams, and we're all going to pass anyway... can the exam be optional? Paul Kahn: [pause] I suppose the exam IS optional... in the sense that law school itself is optional.